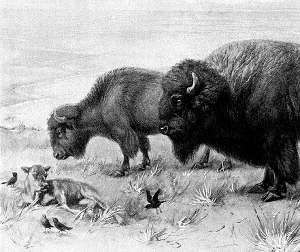 Ernest Thompson Seton was a force to be reckoned with as author and illustrator of scores of books about nature and Indian lore. He was a Scot born Ernest Evan Thompson in England on 14 August 1860, who with his parents emigrated to Canada at the age of six. To avoid an abusive father he took to the woods as an escape, where he became fascinated by nature and drawing animal life. His work was good enough for him to win a scholarship at the Royal Academy in London. Later, he changed his last name to Seton and began a career as an artist, writer and naturalist, eventually moving to New York City where he became successful enough to build a home in Cos Cob, Connecticut, a suburb of Greenwich. He was also famous as a mover and shaper in the U.S.A. of the Boy Scout movement, founded by Lord Baden-Powell, who took Scouting world wide. 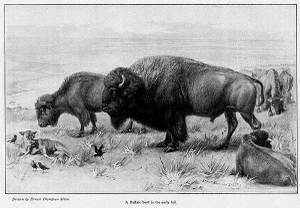 These are scans from his lead article in the October 1906 issue of Scribner's Magazine, The American Bison or Buffalo. 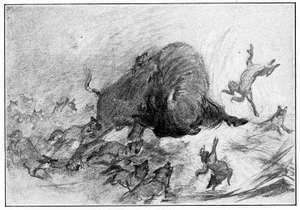 A Buffalo Herd in Early Fall. Detail of the illustration above. 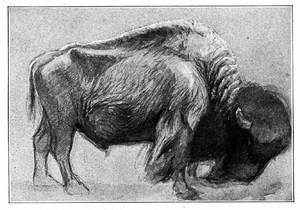 One of the studies Seton made while drawing buffalos. A Catalo, or hybrid cow. A very high-humped old bull buffalo. Seton titled this, The old bull's last fight. The old bull's last fight is it avalible in print?